I met you at the corner of North State and East Pearson in late winter. You told me a little about yourself, and you insisted on showing me your identification. It was as if you needed to prove to me who you were: a full-fledged citizen, a man clinging to his existence. All I could see was your laughing eyes and broad smile, despite the situation you found yourself in. You gave me a lesson in courage, and whether you realized it or not, you gave a little reassurance to this French girl, fresh off the plane, who spent her days wandering the Chicago streets she fell in love with a few months before. A French girl who felt so very alone. What you didn’t know, Willy, is that we have something in common. If I’m still standing, it is only thanks to a few people who crossed paths with me and lent me a hand. I had youth on my side, not to mention a pretty face. Lucky, I guess. That and a fierce survival instinct. You never forget the streets, no matter how many years pass. Consciously or unconsciously, I don’t know, escaping them gives us strength and a certain perspective on life. Most people think I’m spoiled. They envy my nonchalance when they’re not irritated at my smile and my frivolity. It makes me laugh, because they really know nothing about me. I’m highly empathetic, and some stories move me more than others. I couldn’t care less what the squares think. Political correctness leaves me flat. Only actions that come from the heart mean anything to me. 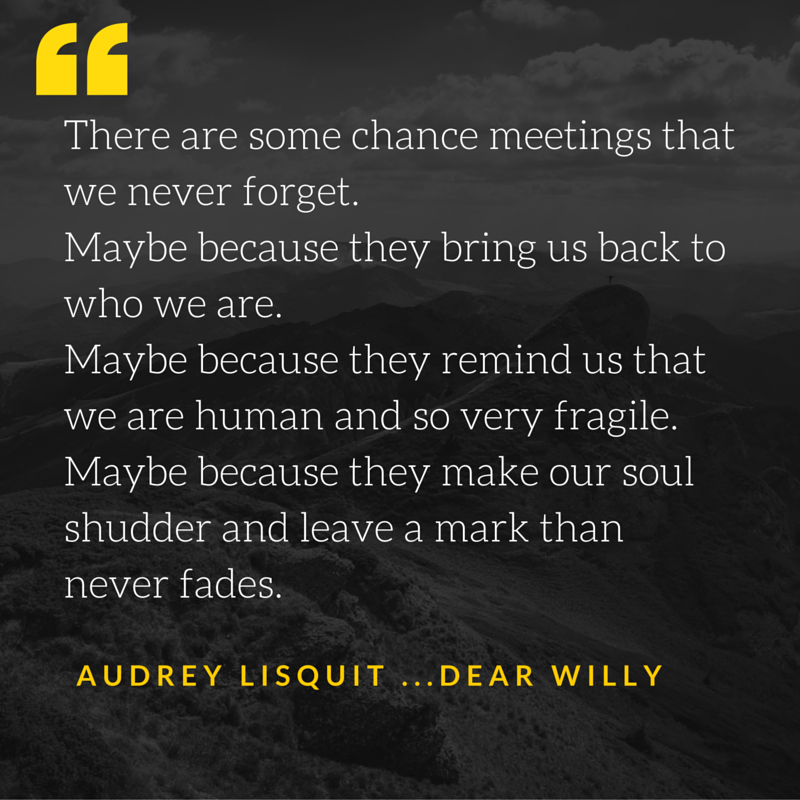 Willy, there are some chance meetings that we never forget. Maybe because they bring us back to who we are. Maybe because they remind us that we are human and so very fragile. Maybe because they make our soul shudder and leave a mark than never fades. I haven’t forgotten about you, Willy. No, not yet I haven’t. I’ve been looking everywhere for you. I promised myself I would find you. I have to. Because there’s no turning back now—you’ve won my friendship. I just hope our paths will cross again one of these days, and I can somehow make things a little better. Take care of yourself, Willy. I hope to see you soon in Chicago. This is a post that is introspective, kind, and demonstrates the compassion we as a society should have for others. There is much we can learn from anyone we meet and a book cannot be judged by its cover. Thank you so much Julian ! It’s about compassion and being Human… from a too sensitive woman !